For my mom’s birthday, I wanted to knit her a pair of socks, as we are both lovers of the great outdoors and nature, hiking, and knitting. 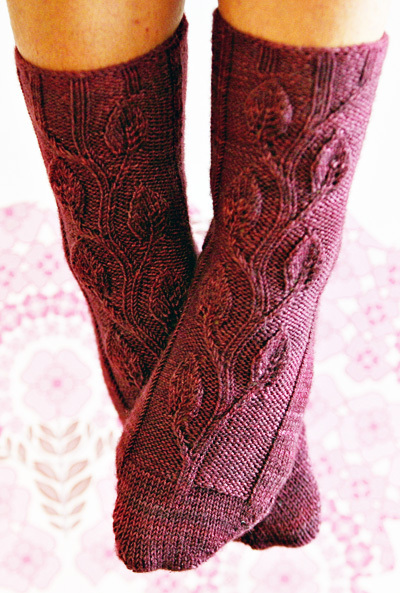 This was a perfect opportunity for creating a leaf-stitch patterned sock. I wanted the leaves to be climbing up the sock, and after knitting the socks and writing the pattern down in virtually incomprehensible notes, I found plenty of socks with leaves cascading their way down the foot, but none where they climbed u. The leaf-stitch is both simple and interesting enough to keep the sock fast and fun to knit. Its simplicity also allows the subtle shade changes in this beautiful yarn to shine though. Scrap yarn for cast on – approximately 2 feet. M1 (make one): from the front, lift loop between stitches with left needle, knit into back of loop. C2B Slip next stitch onto cable needle, and hold at back of work, knit next stitch from left-hand needle, then knit stitch from cable needle. C2F Slip next stitch onto cable needle, and hold at front of work, knit next stitch from left-hand needle, then knit stitch from cable needle. T2B (twist to back): slip next stitch onto cable needle and hold at back of work, knit next stitch from left-hand needle, then purl stitch from cable needle. T2F (twist to front): slip next stitch onto cable needle and hold at front of work, purl next stitch from left-hand needle, then knit stitch from cable needle. Working wrapped knit stitches: picking up wrapped knit stitches: insert the right needle tip into the front of wrap from bottom to top, and then into the stitch. Knit the two together by wrapping the yarn as normal, then bringing the new stitch through the old stitch and then the wrap. Working wrapped purl stitches: pick up the wrap on the right side of the work (that is, the other side than you’re looking at), from bottom to top. Place this wrap on the left-hand needle. Purl the wrap together with the stitch as per a normal p2tog. Round 2 and all following even-numbered rounds: knit the knit stitches and yarnovers, purl the purl stitches. Round 7: P9, C2B, k1, p10. Round 9: P8, T2B, k2, p10. Round 11: P7, T2B, p1, k2, p10. Round 13: P6, T2B, p2, k2, p10. Round 15: P6, yo (yarn over), k1, yo, p3, k2, p10. Round 17: P6, k1, yo, k1, yo, k1, p3, k2, p10. Round 19: P6, k2, yo, k1, yo, k2, p3, k1, C2F, p9. Round 21: P6, k3, yo, k1, yo, k3, p3, k2, T2F, p8. Round 23: P6, k2tog (knit 2 together), k5, k2tog, p3, k2, p1, T2F, p7. Round 25: P6, k2tog, k3, k2tog, p3, k2, p2, T2F, p6. Round 27: P6, k2tog, k1, k2tog, p3, k2, p3, yo, k1, yo, p6. Round 29: P6, k3tog, p3, k2, p3, k1, yo, k1, yo, k1, p6. Round 31: P9, C2B, k1, p3, k2, yo, k1, yo, k2, p6. Round 33: P8, T2B, k2, p3, k3, yo, k1, yo, k3, p6. Round 35: P7, T2B, p1, k2, p3, k2tog, k5, k2tog, p6. Round 37: P6, T2B, p2, k2, p3, k2tog, k3, k2tog, p6. Round 39: P6, yo, k1, yo, p3, k2, p3, k2tog, k1, k2tog, p6. Round 41: P6, k1, yo, k1, yo, k1, p3, k2, p3, k3tog, p6. Repeat Rounds 19-42 for pattern. Round 1: P6, k2, yo, k1, yo, k2, p3, k1, C2F, p9. Round 2 and all following even-numbered rounds:	k the ks and yos, p the ps. Round 3: P6, k3, yo, k1, yo, k3, p3, k2, T2F, p8. Round 5: P6, k2tog, k5, k2tog, p3, k2, p1, T2F, p7. Round 7: P6, k2tog, k3, k2tog, p3, k2, p2, T2F, p6. Round 9: P6, k2tog, k1, k2tog, p3, k2, p3, T2F, p5. Round 11: P6, k3tog, p3, k2, p4, C2F, p4. Round 13: P4, k2, p4, k2, p4, k2, p4. cast on 30 [33, 36] stitches. Setup row: Knit all sts. Row 1 [RS]: K29 [32, 35], wrap and turn (W&T). 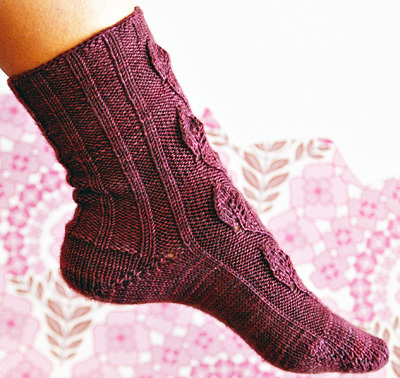 Use the wrap and turn method documented in Amy’s Universal toe-up sock recipe. Row 2 [WS]: P28 [31, 34], W&T. Row 3 [RS]: K27 [30, 33] W&T. Row 4 [WS]: P26 [29, 32], W&T. Row 5 [RS]: K25 [28, 31] W&T. Row 6 [WS]: P24 [27, 30], W&T. Row 7 [RS]: K23 [26, 29] W&T. Row 8 [WS]: P22 [25, 28], W&T. Row 9 [RS]: K21 [24, 27] W&T. Row 10 [WS]: P20 [23, 26], W&T. Row 11 [RS]: K19 [22, 25] W&T. Row 12 [WS]: P18 [21, 24], W&T. Row 13 [RS]: K17 [20, 23] W&T. Row 14 [WS]: P16 [19, 22], W&T. Row 15 [RS]: K15 [18, 21] W&T. Row 16 [WS]: P14 [17, 20] W&T. Row 17 [RS]: K13 [16, 19] W&T. Row 18 [WS]: P12 [15, 18] W&T. Row 19 [RS]: K11 [14, 17] W&T. Row 20 [WS]: P10 [13, 16] W&T. For size M, continue onto short row toe increases now (there should be 10 unwrapped stitches remaining in the middle of the needle). Row 21 [RS]: K -[12, 15] W&T. Row 22 [WS]: P -[11, 14] W&T. Row 23 [RS]: K -[10, 13] W&T. Row 24 [WS]: P -[9, 12] W&T. For size L, continue to short row toe increases now (there should be 9 unwrapped stitches remaining in the middle of the needle). Row 25 [RS]: K -[-, 11] W&T. Row 26 [WS]: P -[-, 10] W&T. For size XL continue onto short row toe increases now (there should be 10 unwrapped stitches remaining in the middle of the needle). Row 1: Slip 1, k9, knit wrapped stitch together with its wrap, turn. Row 2: Slip 1, p10, purl wrapped stitch together with its wrap, turn. Row 3: Sl 1, k11, knit wrapped stitch together with its wrap, turn. Row 4: Sl 1, p12, purl wrapped stitch together with its wrap, turn. Row 5: Sl 1, k13, knit wrapped stitch together with its wrap, turn. Row 6: Sl 1, p14, purl wrapped stitch together with its wrap, turn. Row 7: Sl 1, k15, knit wrapped stitch together with its wrap, turn. Row 8: Sl 1, p16, purl wrapped stitch together with its wrap, turn. Row 9: Sl 1, k17, knit wrapped stitch together with its wrap, turn. Row 10: Sl 1, p18, purl wrapped stitch together with its wrap, turn. Row 11: Sl 1, k19, knit wrapped stitch together with its wrap, turn. Row 12: Sl 1, p20, purl wrapped stitch together with its wrap, turn. Row 13: Sl 1, k21, knit wrapped stitch together with its wrap, turn. Row 14: Sl 1, p22, purl wrapped stitch together with its wrap, turn. Row 15: Sl 1, k23, knit wrapped stitch together with its wrap, turn. Row 16: Sl 1, p24, purl wrapped stitch together with its wrap, turn. Row 17: Sl 1, k25, knit wrapped stitch together with its wrap, turn. Row 18: Sl 1, p26, purl wrapped stitch together with its wrap, turn. Row 19: Sl 1, k27, knit wrapped stitch together with its wrap, turn. Row 20: Sl 1, p28, purl wrapped stitch together with its wrap, turn. 30 sts. Row 1: Slip 1, k8, knit wrapped stitch together with its wrap, turn. Row 2: Slip 1, p9, purl wrapped stitch together with its wrap, turn. Row 3: Sl 1, k10, knit wrapped stitch together with its wrap, turn. Row 4: Sl 1, p11, purl wrapped stitch together with its wrap, turn. Row 5: Sl 1, k12, knit wrapped stitch together with its wrap, turn. Row 6: Sl 1, p13, purl wrapped stitch together with its wrap, turn. Row 7: Sl 1, k14, knit wrapped stitch together with its wrap, turn. Row 8: Sl 1, p15, purl wrapped stitch together with its wrap, turn. Row 9: Sl 1, k16, knit wrapped stitch together with its wrap, turn. Row 10: Sl 1, p17, purl wrapped stitch together with its wrap, turn. Row 11: Sl 1, k18, knit wrapped stitch together with its wrap, turn. Row 12: Sl 1, p19, purl wrapped stitch together with its wrap, turn. Row 13: Sl 1, k20, knit wrapped stitch together with its wrap, turn. Row 14: Sl 1, p21, purl wrapped stitch together with its wrap, turn. Row 15: Sl 1, k22, knit wrapped stitch together with its wrap, turn. Row 16: Sl 1, p23, purl wrapped stitch together with its wrap, turn. Row 17: Sl 1, k24, knit wrapped stitch together with its wrap, turn. Row 18: Sl 1, p25, purl wrapped stitch together with its wrap, turn. Row 19: Sl 1, k26, knit wrapped stitch together with its wrap, turn. Row 20: Sl 1, p27, purl wrapped stitch together with its wrap, turn. Row 21: Sl 1, k28, knit wrapped stitch together with its wrap, turn. Row 22: Sl 1, p29, purl wrapped stitch together with its wrap, turn. Row 23: Sl 1, k30, knit wrapped stitch together with its wrap, turn. Row 24: Sl 1, p31, purl wrapped stitch together with its wrap, turn. 33 sts. Row 20: Sl 1, p28, purl wrapped stitch together with its wrap, turn. Row 21: Sl 1, k29, knit wrapped stitch together with its wrap, turn. Row 22: Sl 1, p30, purl wrapped stitch together with its wrap, turn. Row 23: Sl 1, k31, knit wrapped stitch together with its wrap, turn. Row 24: Sl 1, p32, purl wrapped stitch together with its wrap, turn. Row 25: Sl 1, k33, knit wrapped stitch together with its wrap, turn. Row 26: Sl 1, p34, purl wrapped stitch together with its wrap, turn. 36 sts. Remove cast on scrap yarn, M1, pick up resulting 28 [31, 33] stitches, and M1. Join for working in the round and knit one full round on all 60 [66, 72] stitches. Size M: K4, place marker, p10, k2, p10, place marker, k38. Size L: K6, place marker, p10, k2, p10, place marker, k44. Size XL: K7, place marker, p10, k2, p10, place marker, k50. After the setup round, you will be back at the first marker. This is now the beginning of the round. Foot round: Work Leaves Panel over 22 sts to the second marker, knit to end of round. Continue in pattern as established until foot is 2[2, 2.5] inches short of desired length of foot to back of heel. Row 1 [RS]: K29 [32, 35] W&T. Row 2 [WS]: P28 [31, 34] W&T. Continue as for the toe until there are 10[9, 10] unwrapped stitches remaining in the middle of the needle. Row 2 [WS]: Slip 1, purl wrapped stitch together with its wrap, turn. Repeat these two rows until all wrapped stitches on needle have been worked. 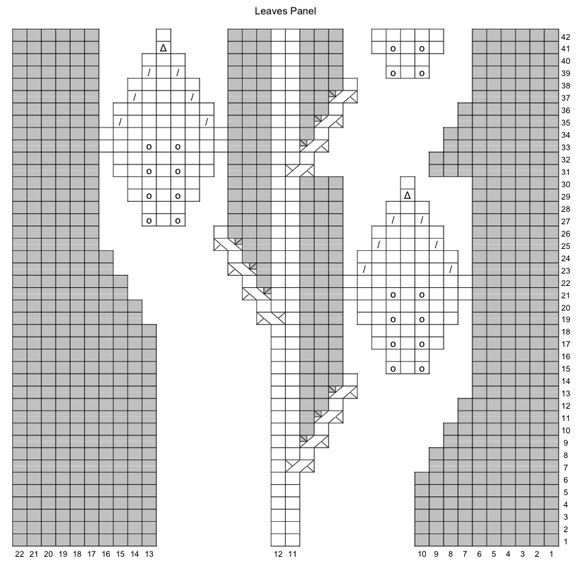 You are now ready to work the leg, picking up where you left off in the Leaves Panel chart. Size M set up round: Work Leaves Panel over first 22 sts to second marker; k2, [p4, k2] six times. Size L set up round: Work Leaves Panel over first 22 sts to second marker; k2, [p4, k2] seven times. Size XL set up round: Work Leaves Panel over first 22 sts to second marker; k2, [p4, k2] eight times. Continue in pattern as established, working Leaves Panel between markers and ribbing on rest of leg until Round 42 of Leaves Panel is complete. If you wish to have a longer leg, repeat rounds 19-42 of the Leaves Panel until leg is desired length. Work all 14 rounds of Leaves Panel Final Rounds to establish cuff ribbing pattern. Work ribbing as established for 1 inch for cuff. Cast off loosely – a larger needle helps, or use the brand-new Jeny's Surprisingly Stretchy Bind Off. Weave in ends. Work second sock with the Leaves Panel mirrored by reading the Leaves Panel pattern in reverse if you wish! Natalie is an unconventional knitter, jack of all trades, and professor of Geology at Bakersfield College. She started knitting many times over the past 2 decades, but really got serious about it during grad school some 6 years ago.In general, she views patterns (and recipes) as guidelines rather than rules. This is her first “official” pattern. She blogs here, and on ravelry as gnatthebrat.